Regular dental cleanings keep your pet healthy! Along with preventing bad breath, teeth cleanings and veterinary dental care prevents periodontal disease. This condition, if left untreated, often leads to serious illness. Dental problems, if ignored, can lead to larger systemic problems in your pet due to oral bacteria entering the blood stream and damaging the kidneys, heart, and liver. Pets can have dental disease, just like you do. Many of these problems can be avoided by bringing your pet to the Animal Hospital of West Lake Forest for regular dental check-ups and teeth cleanings. We provide a full array of veterinary dental services, including complete cleanings and surgical extractions. Your pet's veterinary dental cleaning is much different than the process you undergo each year. 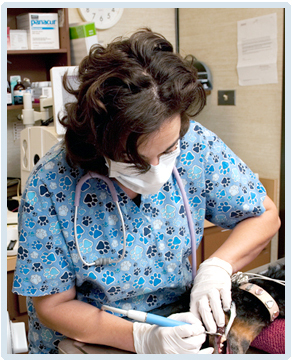 Veterinary dentistry is considerably more involved, time-consuming and complex. Cleaning a pet's teeth requires general anesthesia, and consequently a day of hospitalization. The skills of several people, from veterinarians to veterinary assistants, are required for each dental procedure. At The Animal Hospital of West Lake Forest, your pet's dental cleaning begins with a physical examination. This examination is important for evaluating your pet's general health. After the physical exam, your pet is given an anesthetic for a safe and painless sleep during the dental cleaning. The first part of dental cleaning requires the removal of tartar. This is done with a hand scaler. Next, an ultrasonic scaler is used to clean above the gumline while a curette cleans and smoothes the teeth under the gumline in the crevice. Then your pet's teeth are polished and the gums are washed with an anti-bacterial solution to help delay tartar build-up. Animal Hospital of West Lake Forest also offers digital dental radiology, which produces high-definition images of your pet's teeth. More accurate than traditional radiology, digital dental radiology produces clear images of the area below and above your pet's gum line in order to diagnose dental disease that cannot be seen by visual examination alone. This is a powerful tool for enabling the treatment of dental disease before it becomes much larger and more difficult and expensive to treat. Dental care does not end with a visit to your veterinarian. Brushing your pet's teeth is an important part of home dental care. Any member of the Animal Hospital of West Lake Forest team can show you the proper method of brushing your pet's teeth.